Mike DeWine has entered his new role as Ohio’s 70th Governor with plans to improve the lives of all Ohioans. To do this, he has selected leaders, experts, and public servants from across the state to help him deliver his vision. Jon Husted will serve as Lt. 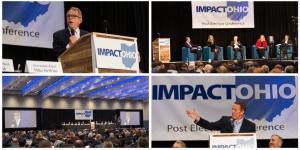 Governor and oversee InnovateOhio, a new program designed to facilitate economic development by implementing new technology that makes state government more efficient. Governor DeWine hopes that these nominees, who bring years of experience and expertise to the new administration, will help him to strengthen our communities and our state. ← Will Ohio Begin Investing in Failing Infrastructure?